This rainbow fell for an olive/pearl Zonker on the Caney last Friday. The fish hammered the fly and proceeded to give my 5 weight a workout. I was glad to have my big net handy. Photographing fish is much easier if you can protect the fish and keep it in the water until you are prepared to take the picture. 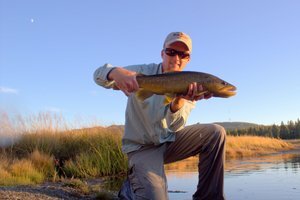 As far as the fishing goes, I caught a few small fish including a brookie and a brown. 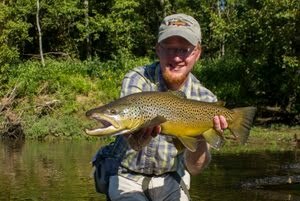 I also fished to a larger rising brown for a while but could never get it to eat. Overall the water clarity is marginal at best and I can't really recommend fishing the Caney for another month at least due to the clarity problems. The sluice gate will be in operation for some time until the temperatures come down and the dissolved oxygen levels from the generators improve. This, combined with the lake turning over soon, means that the clarity will continue to be an issue. Right now, the hot place to be is the South Holston. 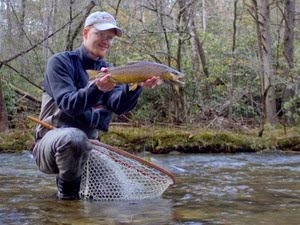 Good numbers of nice fish are being caught, including some very nice fish to around 25 inches on streamers. The sulphurs are still hatching and the fall BWOs have started. Expect to find the BWO hatching best on cloudy days and the sulphurs will tend to be better on sunny days. Water levels in the mountains are still low to extremely low. 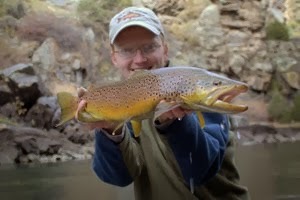 Until we get some substantial rain, fishing in the mountains will be tough at best. 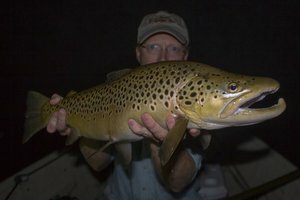 Fall hatches are coming on now in the mountains and should provide good fishing until we get consistently cold weather that brings stream temperatures down to winter time levels.